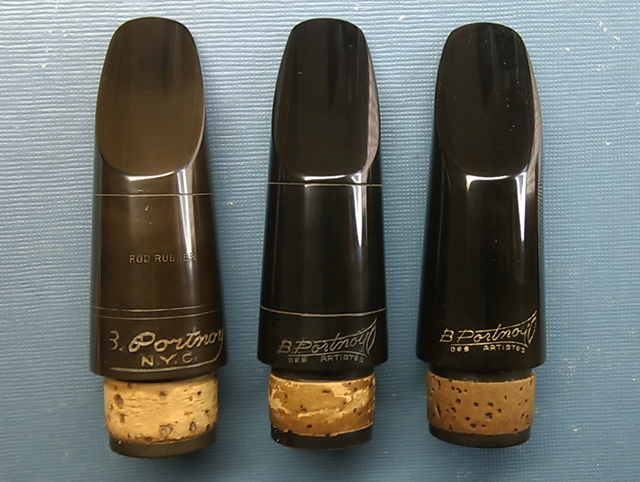 Pictured below are three generations of Bernard Portnoy clarinet mouthpieces. On the left is his first commercial model, made in the 1950s. It is very much in the traditional Chedeville/Lelandais style, with a closer facing, deep chamber and baffle. The mouthpiece in the centre is the design from the 1960s that Leopold Stokowski famously endorsed. Portnoy introduced his open tip BP2 and BP3 facings with these models – they had much straighter baffles which complemented the open tip facings. Portnoy was not himself a mouthpiece craftsman, and commissioned Miller in Milwaukee to do the work and finishing until the 1970s. Miller used Lelandais and Riffault blanks for these earlier pieces. Pictured on the right is an example of the current Portnoy mouthpiece made by JJ Babbitt, in production since the 1970s. These are still manufactured in the standard Portnoy facings, BP1, 2 and 3. Portnoy mouthpieces post 1960s sadly vary considerably and are often poorly finished and faced, however with work they can turn out wonderfully well, especially with open facings, as that is what the internals are geared for. Many professional players in London and the UK are using Portnoy mouthpieces that I have refurbished. I am now a Portnoy distributor for the UK and will soon be offering new and specially enhanced Portnoy mouthpieces. Stay tuned…. Is your Neopolian M.P. on the market yet?